The Mission of the Subblette County School District #1 Transportation Department is to provide safe, timely and courteous transportation services for students, staff and community through a well- trained and positive staff. The safety of our students is priority number one. Our drivers will be highly skilled, knowledgeable, caring, transportation professionals. The transportation department is dedicated to providing first class service to our students and parents. The transportation department is committed to continuous improvement and a team concept that values the input of all stakeholders. All students will be held to high behavioral standards which will be consistently enforced. Alert to the Parents of Students on Activity Trips or other activities offered by the School District. Listen to what school you would like to reach. 4. Listen to the activity or event that you are trying to find, and press that key, if it's not listed, press the key for all other. 5. Drop off locations for returning activity buses will be at the following locations. At School, Daniel Junction (formerly Stanley's Jct) and at the Boulder Store. 1. Practice the same conduct as in the classroom. 2. No vulgar language or gestures will be allowed. 5. Keep the noise level down. 6. No alcohol, drugs, tobacco, or anything that can be considered a weapon will be allowed on the bus at any time. 7. No destructive behavior will be allowed. 8. No Hitting, fighting on the bus. (Your hands need to be kept to yourself). 9. Don't put anything out the windows (Hands, feet, head,etc. - trash). 10. Stay in your seats. Remain facing forward at all times. 11. Don't stand or walk, or move seats while the bus is moving. 12. Cooperate with and Respect the bus driver. 13. The driver is authorized to assign seats. 14. Remember that riding a bus is a privilege. 15. Drivers shall stop to load and unload students at authorized bus stops only. 16. If your (Child) will be riding on another bus, or going home with a friend, the parent needs to send a note for the bus driver. FOOD NOTE:Due to the increasing enrollment in the school district and more students with potentially dangerous medical conditions, the transportation department is taking proactive steps to ensure the safety of students who ride the buses. By eliminating food and drinks students with food allergies will not be exposed to harmful allergens. This will also avoid choking hazards. Consequently, NO FOOD AND/OR DRINKS WILL BE ALLOWED ON THE ROUTE BUSES. Exceptions are individuals who need access to food (i.e. diabetics). Individuals who have anything to eat or drink will be asked to put it in their backpacks while they are on the buses. At this time food and drinks WILL BE ALLOWED on activity and field trip buses. Teachers, coaches, and sponsors will be informed of any potential problems that might exist. If you have any questions or concerns, please call Kevin Warren transportation director, or Jeanette Sanborn, assistant transportation director, at 367-2130. 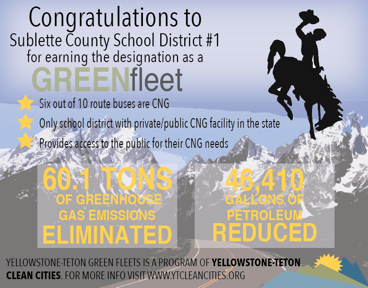 We are proud to provide a Green Fleet! Sublette County can present weather conditions that make the operation of a route bus difficult or even impossible. The transportation department is equipped with vehicles that are well designed to handle the difficult conditions and the state and county snow plows do an excellent job of clearing our roads. Although infrequent, it may be necessary to close school due to extreme weather conditions. 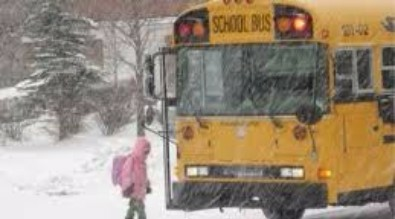 Buses will not transport students if it is deemed unsafe. The decision to close schools is based on a variety of factors, but road condition and temperature are the primary considerations. SCSD 1 is a very large district and weather conditions can vary greatly throughout the district. From the far end of the Bondurant route to the far end of the Boulder route spans a distance of 80 miles. As a result, it may be necessary to close or modify individual bus routes on days that the district as a whole is open. In the event that an individual bus route is closed or modified, the Transportation Department will utilize the BlackBoard Connect automated communication system to inform those affected. Due to the distances traveled by our bus routes, some routes leave as early as 5:30 AM. As a result the decisions to close school will be announced as close to 5:00 AM as possible. If conditions warrant, the decision may be made the night before to allow parents and guardians additional time to arrange child care. Decisions made the night before will be made prior to 11 PM. SCSD 1 relies on well trained drivers to evaluate the conditions while on the road and to make decisions with safety as the top priority and delegates authority to drivers to discontinue or modify routes as needed to ensure the safety of our students. Drivers will radio the Transportation Department with information of such changes so that they can be communicated to parents/guardians as soon as possible. BlackBoard Connect Automated Communication System (text, email and phone). The BlackBoard Connect Automated Communication System obtains parent contact information from a nightly sync with the District's Student Information System (PowerSchool). Parents are urged to keep their contact information current in PowerSchool to receive accurate information regarding closures and route modification.